Size: 468 sq.ft. - 17,016 sq.ft. The Hartland project is a freehold property located in a prime location of Mohammed Bin Rashid Al Maktoum by Sobha Developer. Sobha Group is India and Dubai based real-estate company. This project has been designed in the vicinity of the world’s tallest building. It is a mega luxurious development over 8 million sq. ft. enveloped with 40% of greenery. There are 18 different layouts that have been designed for these villas which give the clients a variety of options to choose from. Giving options of stylish studios, spacious 1, 2 and 3 BR apartments and penthouses are included in their design approach.The villaswill cost from Dh12.5 million at prices starting from Dh2006 per square foot for a 6259 sq.ft villa. Hartland by Sobha Ltd will comprise of 282 grand residences in a high rising tower enhancing modern style of living. The development covers 8 million sq. ft of which 40% is dedicated to green & ecofriendly living. The Hartland project is a huge township with the combination of retail spaces, spa, entertainment facilities, two educational institutes and hotel. Sobha Hartland will also have 4 Bedroom, 5 Bedroom and 6 Bedroom grand villas with spacious and comfortable homes. The sizes are ranging from 710 sq.ft. to 1500 sq.ft. Over 1/3rd of the land development is committed to greenery as well as being right now presenting exclusive residences and villas. Hartland Villa sizes will range from 6,250 sq. ft. to 18,432 sq. ft. There will also be two mixed-use towers, nine blocks of ground-plus-48 storeys, three blocks of ground-plus-20 and 18 blocks of ground-plus-8. 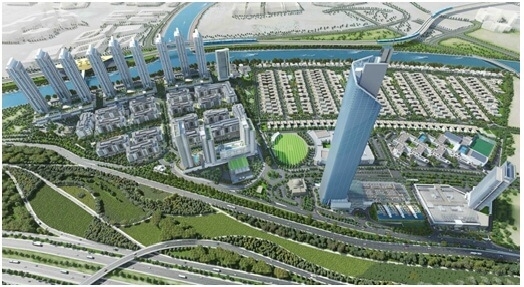 * Hartland Cummunity is only 3 km away from BurjKhalifa&The Dubai Mall. * It is 6 minutes from Dubai International Finance City. Sobha Hartland Project lies at the Mohammed Bin Rashid Al Maktoum City, near Burj Khalifa Dubai. Sobha Hartland community is designed with eco-friendly lifestyle and gives amenities such as freehold villas, mid and high-rise apartments, hotels, offices, two international schools, a clubhouse, mosques and retail centres, retail outlets, hotels and entertainment facilities all in one central location. An endless enjoyment with numerous facilities including a fitness centre, outdoor pools, sauna and spa, children`s club with a play zone and pool, sunken barbeques and entertainment space, as well as shops, food and drink outlets and a supermarket all within the community. Schools: - Our Own Indian School, Latifa School for Girls, The Indian High School, Horizon School, Gem Private School. Hospitals: - Rashid Hospital, Mediclinic City Hospital, Iranian Hospital, Latifa Hospital, Emirates Hospital, American Hospital. Movie Theatres: - Meydan Theatre, The One Jumeirah Theatre, Golden Cinemas, Medinat Theatre. Malls: - The Dubai Mall, Wafi Mall, Mercato Shopping Mall. Banks/ ATMs: - NBAD Bank, Emirates NBD Bank, HSBC Bank, Dubai Islamic Bank, Barclays Bank. Restaurants: -Cafe Havana, The Track, Four Points by Sheraton, Radisson Blue Hotel, Baker & Spice. 780 sq.ft. - 1230 sq.ft. 468 sq.ft. - 17,016 sq.ft.